You may not always find it easy to be grateful. I know that when I am in fear, anxious, angry or too self-absorbed my level of gratitude is low. But here’s the cure: do something for others. Give and do it with a generous heart. It is both good for them and good for you. Your mental and emotional well-being improves. Plus, you can’t be angry and grateful at the same time. Considering all that has been happening in the world I think it would be an excellent suggestion for each of us to give thanks and do it by sharing with others. It’s the Thanksgiving Holiday here in the United States, a great time to share your food, share your wealth, share your love and share your story. Thank you so much for being part of the Your Life Is Your Story community. Thanks to all our subscribers. I hope you enjoy this month’s issue. You are receiving this e-zine because you signed up for it or someone who is subscribed passed it along to you. If a friend DID forward this to you consider subscribing by visiting our signup page . Also, let me know what you’d like to see more of in this newsletter – simply reply to this email e-zine. My dad used to say that the reason he joined the Air Force right out of college was because they would pay him to do what he loved, which was to fly airplanes. He couldn’t believe his good fortune! A lot more went into that career than flying into "the wild blue yonder". He had to deal with authority and eventually rise to those kind of positions. He served for 26 years and reached the rank of Full "Bird" Colonel. There was bureaucracy, power struggles, conflict and war. Through it all, however, he got to fly and he was good at it. He did what many people long to do, but too few actually accomplish. He followed his bliss. That saying, coined by Joseph Campbell, essentially means to do what you love to do. We all have dreams and we all have special talents or gifts that our heart and soul desire to use. If you get to do it in your life you’ve done something really special. I was chatting with my college buddy and former radio colleague the other day. He’s from Oklahoma and we met at OU (University of Oklahoma) in 1975. John Florence is an expert on music and he was the guy I most wanted to talk to after the great Leon Russell recently passed away. John is down home and honest. He gets to share his knowledge and incredibly good taste in the selection of songs he broadcasts each morning on a community radio station in Salt Lake City, Utah. The show, A Brand New Day on KRCL features songwriters and music that have shaped his generation, which also happens to be mine. We are gray-haired and wrinkled, some would call "seasoned", but back when we were bright-eyed college idealists we dreamed of following our bliss and having radio shows with creative freedom and an opportunity to share the music and songs we love. "I’m just getting to do what I’ve always wanted to do," John told me. A lot of good people have passed on in 2016. Many of the musicians and songwriters that have made a difference in my life are among them. But I have to get used to it. They are all getting long in the tooth. Fortunately, many of them are still alive and still doing what they love. Bob Dylan, Paul McCartney, Van Morrison, Eric Clapton, Chuck Berry, Keith Richards, Mick Jagger, Neil Young, Carole King, James Taylor, John Prine and a host of others are still with us and they haven’t yet "retired". I know many "regular" people who have spent much of their life doing what they love. Most of them aren’t rich or famous, but they are making a difference in the lives of others and that has a value beyond a dollar sign. Thanks be to the teachers, preachers, nurses and doctors, artists and artisans, storytellers and writers. On the verge of another Thanksgiving Holiday your contributions do not go unnoticed or unappreciated. Keep following your bliss – you are walking a worthwhile path and setting an example for others to follow. You can read other life story articles here. I am sure you’ve seen signs that show the mileage to destinations. Not the kind on the highway, but those funky looking poles or stands with multiple little arrow-shaped signs stating how far to a town, city or tourist location. Those signs bring to mind memories and dreams about those destinations. They are fun and amusing. 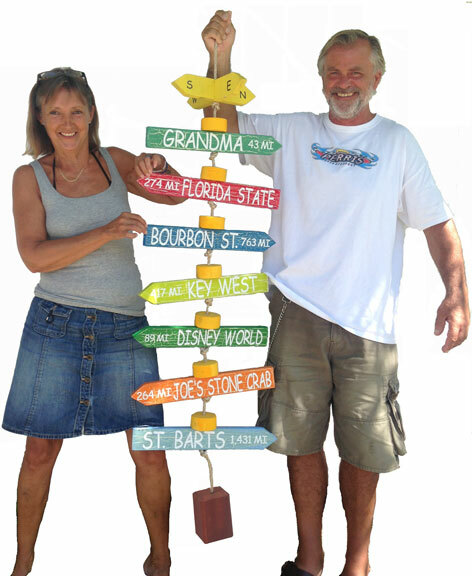 How would you like a customized journey marker to show off your favorite spots in life? I came across just this thing and these Personalized Journey Markers come in a variety of styles (hanging, tabletop and post, to mention a few). Each one is made to order and is a unique "mile marker" for your life journey. Jay Keeler has been doing this for years and he invites you to take a look at what he offers. Go here and look around. If you place an order be sure to enter the access code Your Life. With the holidays this could a great gift idea that is definitely different and an interesting way to preserve some life memories.